The Romans, particularly legionnaires with the army, were intimately familiar with the act of camping. When on long marches away from home and civilization, the Roman forces would have no choice but to break out their camping supplies in order to create a safe and secure place for the army to rest. Roman camping equipment often consisted of essentials that would be required for survival, including things like cooking tools, water rations, and other important materials that would allow construction of a safe and relatively comfortable position suitable for temporary rest. 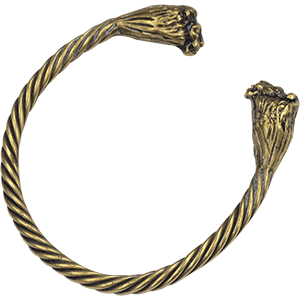 We offer many items that could likely have been found on a Roman legionary or located in the camp of a Roman army. 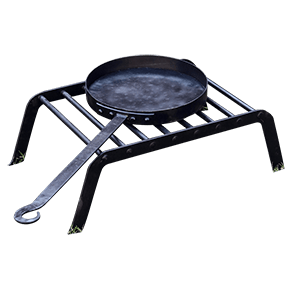 Things like all-metal buckets and cooking pans would have been common, as would simple fire braziers constructed of metal slats and simple stoves for efficiently preparing meals over campfires. All of this, and more, can be found here in our Roman Camping Gear category, where you can turn back the clock on your camping experience and do it just like the Romans did roughly 2,000 years ago. We have a wide selection of Roman apparel for men and women. Our brightly colored Roman tunics copy the standard issue to the Roman legions from the days of the Republic to the end of the Empire. Worn under Roman armour or by itself, woolen tunics would keep legionnaires warm and provide protection and padding from armour. The Romans belts were used to hang swords and daggers and show position and rank. Roman soldiers often wore Roman sandals called caligae that were made of leather with studs on the sole. 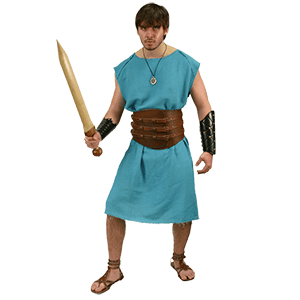 We carry high quality Roman clothing and gladiator clothing like war skirts and Roman arming wear, as well, giving you plenty of options for reenactments, theatrical productions, the Renaissance fair, and costume parties. Given the span of time that the Romans held their empire, it stands to reason that they developed extensive Roman currency and coinage, especially since each emperor wanted to have his likeness displayed. We offer a wide array of Roman coins based on historical coins found among ruins and museum collections. These Roman emperor coins come in designs cast in pewter with antiqued or gold-plated finishes. Our Roman coin replicas come in various denominations, from the small as to the major denarius and aureus. 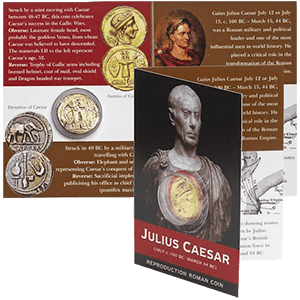 Many collectible coins even include detailed pamphlets, offering snippets of information about the coin itself and the Roman activities at the time of the its creation. These Roman coin packs are fantastic gifts for collectors, gamers, and reenactors. Many Roman soldiers carried historical blades called pugio. Pugio daggers had very short but wide leaf-type blades that extended about 7 to 11 inches long. We carry an excellent selection of these Roman daggers, many of which are replicas of weapons that have been preserved in remarkably good condition in museums. 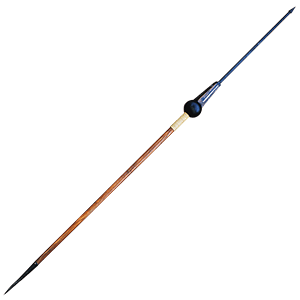 The Roman pugio was used for stabbing and thrusting when fighting in close quarters with the enemy. When legionnaires were in close formation with an enemy, swords or spears could become impractical, yet these kinds of Roman knives could still be wielded, which is why they were the basic part of the Roman army gear. 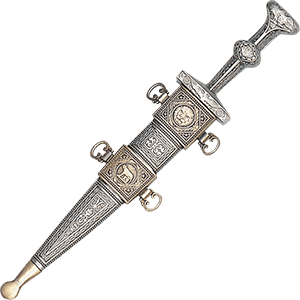 Our Roman daggers and pugio replicas make fantastic collectible blades and reenactment weapons for history buffs. We provide a great assortment of Roman gifts that make great presents for anyone who happens to love Roman history and culture. The Roman Empire had a profound effect on the development of the Western world, influencing language, politics, science, warfare, and religion. These Roman collectibles are inspired by historical symbols and figures from culture and mythology, and they show off excellent detail. 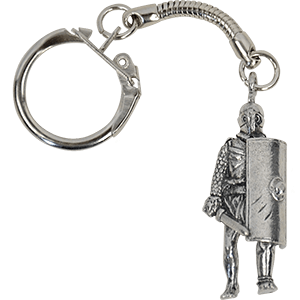 We carry Roman keychains, Roman pencil toppers, decorative thimbles, Roman pin badges, Roman pens, Roman miniatures, Roman letter openers, and more odds and ends decorated with gladiators, Roman helmets, Roman currency, and various animals. Given this broad array of Roman giftware, there is sure to be something that catches your eye. Roman centurions, legionnaires, and gladiators wore many kinds of protective headgear during the reign of the Roman Empire. One traditional Roman soldier helmet was called a galea helm, while another was known as the Imperial Gallic helm due to the influence of the Gauls. Many of these historical helmets featured cheek plates and flared out in the back to protect the neck area. Other Roman helms displayed dramatic crests made of real plumes or horse hair, marking the ranking Roman officer. 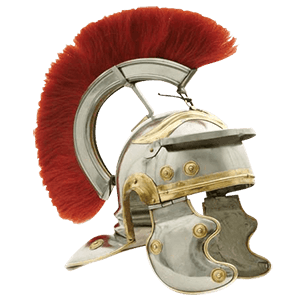 We carry a wide variety of Roman helmets for collectors and reenactors, such as Roman crested helms, gladiator helms, and Greco-Roman helms. We are sure that you will find the right Roman soldier helm to pair with the rest of your Roman armour. The most common Roman shield was called a scutum, the Latin word for shield. The Roman scutum was constructed in a rectangular and semi-cylindrical design. This curved shape would protect Roman soldiers along the front and sides. Roman shields were used by legionnaires to deflect ranged weapons like spears and to protect them in close combat. As time went by, Roman oval shields began to be used as well by foot soldiers and cavalry troops. 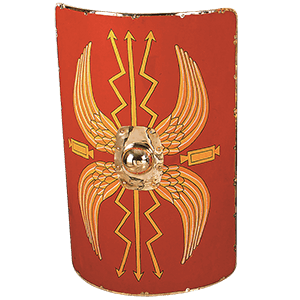 We carry excellent decorative and functional Roman shields in various shapes and sizes. Many of these legionnaire shields, centurion shields, and gladiator shields display intricate artwork showing laurels, wings, scorpions, and other symbols. We also carry Roman shield bosses that can provide additional detail to your metal or wooden shield. We carry a wide array of Roman statues that are great for adding a touch of Roman style and elegance to any room. These Roman figurines include Roman mythology statues as well as other designs depicting characters as varied as Roman soldiers and Roman emperors. 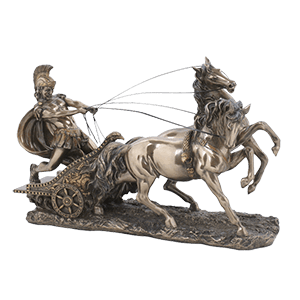 Our centurion statues and legionnaire statues are joined by incredible Roman charioteer statues that show off details like rearing horses to create a dramatic scene. These historical statues come in a variety of sizes and finishes, including some that have been brightly colored or gilded. With their excellent craftsmanship, these Roman collectibles are sure to impress wherever they are displayed. These Roman figures also make fantastic gifts for those fascinated by Roman history and culture. 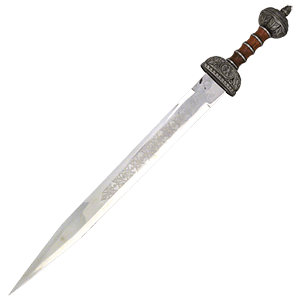 The legionnaires of the Roman Empire used a historical short sword called a gladius as they went to war. The gladius sword averaged 18 to 24 inches in length, its design inspired by Spaniard blades. The primary function of this Roman sword was for thrusting and stabbing in close combat with the enemy. 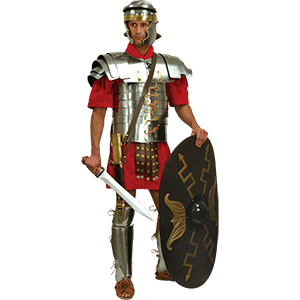 We carry an excellent selection of fully functional Roman soldier swords like gladiator swords, Roman spatha, Mainz gladii, Pompeii gladii, sica swords, Roman dolch swords, and more. Many of our Roman centurion swords and legionnaire swords can be used for stage performances, reenactments, or historical events, while other decorative swords are ideal for collectors.